There is no photo in the family history documents I inherited and little recorded of Ellen’s life and it is supposed that she played a subordinate and supportive role to the family as expected of women during this era. As the eldest female child she would have gradually assumed increasing domestic responsibility for the family with nine further siblings and a sister who was an invalid. She never married. She had suffered a cerebral haemorrhage and her death was reported to be sudden. Both her parents had died only a few months before her. 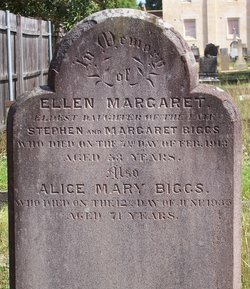 She is buried at St Thomas Church of England Cemetery, Enfield, in a shared grave with her sister, Alice Mary Biggs. Birth Certificate for Ellen Margaret Biggs, 6 December 1859, Registration No. 1859/002352, Registry of Births Deaths and Marriages, New South Wales. Certified copy in possession of author. Death Certificate for Ellen Margaret Biggs, 7 February 1913, Registration No. 1913/003725, Registry of Births Deaths and Marriages, New South Wales. Certified copy in possession of author.